Since the early 1990s, the City of Chandler has experienced exponential growth, ranking among the fastest-growing municipalities in the country. Nearly 100,000 homes dot the landscape today and the population has surged to more than 238,000 residents. The heart of Chandler remains its revitalized historic downtown, which includes the award-winning Chandler City Hall and a Center for the Arts. In 2010, Chandler was named as an All-America City, bestowed by the National Civic League. Chandler was the only Arizona winner for the 61st annual awards. In 2012, the city celebrated its 100th birthday. Centennial events were planned throughout the year. According to the United States Census Bureau, Chandler has a total area of 58.0 square miles (150 km2), of which 57.9 square miles (150 km2) of it is land and 0.1 square miles (0.26 km2) of it (0.17%) is water. In the city, the population was spread out with 29.8% under the age of 18, 8.6% from 18 to 24, 38.0% from 25 to 44, 17.8% from 45 to 64, and 5.8% who were 65 years of age or older. The median age was 31 years. For every 100 females, there were 99.7 males. For every 100 females age 18 and over, there were 96.9 males. There are 101,229 Housing Units as of May 2016. The median income for a household in the city was $70,456, and the median income for a family was $81,720. Males had a median income of $44,578 versus $31,763 for females. The per capita income for the city was $23,904. About 4.6% of families and 6.6% of the population were below the poverty line, including 7.7% of those under age 18 and 8.0% of those age 65 or over. Since 2003, more than 2,900 jobs and investments totalling $3 billion have been created along the Price and Santan freeways, between Arizona Avenue and Gilbert Road in the so-called South Arizona Avenue Corridor. Three shopping malls provide a "strong attraction" to such an open-ended, high exposure trade area: the 1,300,000-square-foot (120,000 m2) Chandler Fashion Center, opened in 2001, has spurred on several courts and laneway developments. In the southern end of the Corridor, Wal-Mart is expected to draw business from as far south as Hunt Highway, bringing with it a "large consumer population" which will improve "the image and perception of the area" in the mindset of many Greater Phoenix residents and state commercial retailers. The northern portion is "attractive and possesses the historic character" for success, which "can be grown to the south". Companies headquartered in Chandler include Infusionsoft, Microchip, and Rogers. Bashas' headquarters is located in a county island surrounded by Chandler. A.J. 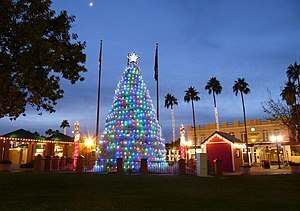 Chandler Park, located in downtown Chandler, contains a tumbleweed Christmas tree during the holidays. There are numerous properties in the town of Chandler which are considered to be historical and have been included either in the National Register of Historic Places or listed as such by the Chandler Historical Society. The Historic McCullough-Price House, a 1938 Pueblo Revival-style home, was donated to the city by the Price-Propstra family in 2001. The city renovated and opened it to the public in 2007. On June 12, 2009, the McCullough-Price House was added to the National Register of Historic Places, the official listing of America's historic and cultural resources worthy of preservation. The city of Chandler operates the facility, which is located southwest of Chandler Fashion Center at 300 S. Chandler Village Dr.
On May 18, 2016, a national nonprofit parks and recreation advocacy organization based in Washington, D.C., announced that Chandler was a 2016 Playful City USA community, marking the tenth consecutive year the city earned the distinction (one of just 12 founding U.S. cities to receive the honor for the tenth consecutive year since the program was initiated in 2007). Chandler was recognized for taking an innovative approach to making play a priority throughout the city with its many recreational amenities, parks and aquatic centers. Chandler's regional Tumbleweed Park hosts a variety of special events throughout the year, including the annual Ostrich Festival, the Fourth of July Fireworks Festival and the sixth annual Day of Play, attended by more than 5,000 people, was held on Saturday, October 27, 2012 at Tumbleweed Park. On August 28, 2009, Chandler's Community Services Department received three Arizona Parks & Recreation Association (APRA) Awards: Outstanding Facility – Mesquite Groves Aquatic Center; Outstanding Community Special Event – Woofstock; and Outstanding Active Adult Program – (Chandler Senior Center Patriot Project). On October 12, 2011, Chandler was named one of the 2011 100 Best Communities for Young People, marking the fifth time that the city received this designation by the America's Promise Alliance and Ing. The award program honors communities across America for their commitment to provide healthy, safe and caring environments for young people. Chandler was recognized for its collaborative efforts between the city, schools, non-profit organizations and community members. Programs such as ICAN, the Mayor's Youth Commission, Chandler CARE Center and the Youth Enhancement Program are just some of the highlights of Chandler's success. Chandler is represented by a mayor, a vice mayor and five city council members. The vice mayor is elected by the city council from among its members. The mayor, vice mayor and council members represent the entire city and are not elected from districts or wards. Education alternatives include charter schools, Christian schools, parochial schools, magnet schools, as well as "traditional" academies. The leading charter schools in Chandler are BASIS Schools and Legacy Traditional School. The two-year Chandler-Gilbert Community College, serving 13,000 students, is located in the east of the city near the Gilbert border. Private educational institutions Western International University and Apollo Group subsidiary University of Phoenix and have locations here. International Baptist College is located in Chandler. Arizona State University is located 14 miles (23 km) from downtown in Tempe. 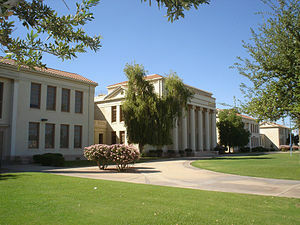 Ottawa University began offering adult education programs in Chandler in 1977. Chandler University opened in 2011. As part of a family literacy project to encourage literacy and library use among families who live in public housing, the Chandler Public Library visited four public housing locations to offer a four-week series of programs at each. The Sunset branch's recently remodeled interior has transformed the community center into a bright place of reading and computer areas. Most incorporated portions of Chandler, along with other East Valley cities Gilbert, Mesa, and Tempe, have their own addressing system distinct from the city of Phoenix and Maricopa County. The north-south meridian is Arizona Avenue, also known as State Route 87. Commonwealth Avenue, two blocks south of Chandler Boulevard, is the east-west baseline. With the significant exception of the stretch of the city from Chandler Boulevard to Ray Road, address numbers follow in mile-long increments of 1000 along the grid. Modern remnants of county addressing (which corresponds to the city of Phoenix system) from the city's rural agrarian days can be found in some neighborhood street names (90th Place, 132nd Street) and county islands surrounded by the city proper. Chandler Municipal Airport is a two-runway general aviation facility located in the heart of the city south of Loop 202. Gila River Memorial Airport in the Gila River Indian Community may serve the city in the future. In western Chandler, Stellar Airpark is a privately owned airport that is open to the public. The nearest commercial airport to downtown Chandler is Phoenix-Mesa Gateway Airport located roughly 10 miles (20 km) to the east, which offers service to 35 cities as of July 2015. For international and regional travel, most area residents continue to use Phoenix Sky Harbor International Airport, 20 miles (30 km) from downtown Chandler. Chandler has very limited bus service compared with other Valley Metro cities of similar size; it currently ranks sixth in total ridership behind Phoenix, Tempe, Mesa, Scottsdale, and Glendale. Most local routes dead-end a few miles from the city or have further limited service within its borders. Currently, two express bus routes leave from the city near downtown, and a new park and ride facility was recently completed further south. Faced with increasing congestion, the land-locked city is pursuing transportation alternatives, including enhancement of the local bus system. This goal has partially been achieved through Proposition 400, which converts transit funding from city-based to county-based. The result has been increased frequencies on routes 72, 81, 96 (since July 28, 2008), 112, and 156, as well as Sunday bus service on the 72, 112, and 156. However, other routes have yet to be converted to "supergrid" status. Loop 202, the Santan Freeway, completed through the city in 2006, cuts through the midsection of the city along the Pecos Road alignment. Loop 101, the Price Freeway, was completed in 2001, dividing West Chandler from the rest of the city. A majority of the city's employment, over 10,000 people as of 2007, are along the city's Price Road Corridor. Air Products' industrial pipelines located there are unique to the metropolitan area. South of Pecos, the freeway borders the Gila River Indian Community. Interstate 10 is the city's westernmost border. Located on the other side is the Phoenix neighborhood of Ahwatukee. Chandler is served by two single-track branch lines of the Union Pacific Railroad. One generally traverses the Kyrene Road alignment and currently dead-ends at the Lone Butte Industrial Park. The other runs east of Arizona Avenue and dead-ends near Sacaton, Arizona. Commuter rail service on these lines is under study as of 2007[update]. Suhwaro Hotel built in 1900 and located in 58 W. Buffalo St. in Chandler, Arizona. Architectural Style: Mission/Spanish Revival. The building is listed in the National Register of Historic Places. Reference #94000575. The Edwards House is the "Maples" model from the 1913 Aladdin Company catalog. The house is located at Tumbleweed Park at 2250 S. McQueen Road. It is listed as historic by the Chandler Historical Society. The McCroskey House was built by George Edwards in 1917 and was originally near Pecos and Dobson Roads. The house was sold to the McCroskey family and is located at Tumbleweed Park at 2250 S. McQueen Road. It is listed as historic by the Chandler Historical Society. The McCormick Building was built in 1928 and is located at 149 West Boston Street. It originally housed the I.O.O.F. (Independent Order of Odd Fellows) Hall and Armory. The building is listed as historical by the Chandler Historical Society. The Monroe Building was built in 1912. The building is located at 28 San Marcos Place. The Chamber met upstairs and the lower floors were leased to stores. Merchant E.W. Monroe, after whom the building is named, leased the first floor for the Monroe Hardware Company, Chandler's first hardware company. In 1915, the top floor space was converted into Chandler's first movie theater, where silent pictures were shown. In 1919, the second floor became offices for Chandler's first attorney Arthur E. Price, after whom Price Road is named. The building is listed as historical by the Chandler Historical Society. The Hotel Chandler Building was built in 1914. The building is located at 98 San Marcos Place. Chandler's first elected mayor, David A. Jacobson, financed the construction of this building. The bottom floor was leased out for stores, and the second story was a reasonably priced hotel, an affordable alternative to the San Marcos Resort. Many prominent Chandler businessmen, especially those working downtown, kept permanent residence in rooms at the Hotel. The building is listed as historical by the Chandler Historical Society. The Price Building was built in 1914 and is located at 80 S. San Marcos Place. It is named for Arthur E. Price, who owned it at one time. Price, Chandler's first attorney, drafted Chandler's incorporation charter in 1920. Price Road is named after him. The building is listed as historical by the Chandler Historical Society. The Dobson Building was built in 1912 and is located at 64 S. San Marcos Place. John H. Dobson, who first homesteaded in the Mesa area in the 1890s, was one of the most instrumental men in Chandler's early history, financing many private and public ventures, as well as establishing the First National Bank in 1919. Dobson Road is named after him. The building is listed as historical by the Chandler Historical Society. Southern Pacific Railroad Locomotive No. SP 2562 and Tender No. 8365 were built in 1900. It is on exhibit in the Arizona Railway Museum located at 330 E. Ryan Rd in Chandler, Arizona. The locomotive is a Model: BLW 2-8-0, built as: SP 2562 (2-8-0) by the Baldwin Locomotive Works, Serial Number: 29064. The locomotive and tender are listed in the National Register of Historic Places. Reference #09000511. The north central section of the city & the western "leg" of the city are within Arizona's 9th congressional district , served by Representative Greg Stanton, a Democrat. The rest of Chandler is within Arizona's 5th congressional district, served by Representative Andy Biggs, a Republican. Chandler's western "leg" & a small, narrow portion of the adjacent northern part of the city are within Arizona's 18th Legislative District, served by Representatives Denise Epstein & Jennifer Jermaine & Senator Sean Bowie, all Democrats. The rest of the city is in Arizona's 17th Legislative District, served by Representatives Jennifer Pawlik & Jeff Weninger & Senator J.D. Mesnard, one Democrat and two Republicans. ^ ChandlerAZ.gov, [The Story of Chandler, Arizona http://www.chandleraz.gov/default.aspx?pageid=37]. Retrieved October 13, 2009. ^ "Driving Chandler's Streets". maricopa.edu. 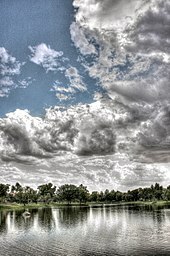 ^ "Average Weather for Chandler, AZ – Temperature and Precipitation". Weather.com. Retrieved August 5, 2010. ^ "Intel Company Overview" (PDF). Intel. ^ Gonzales, Angela (January 2, 2004). "Chandler develops biomed center, adds 270 jobs". Phoenix Business Journal. Retrieved June 2, 2006. ^ "Industrial Sites". Chandler Economic Development staff, City of Chandler. Retrieved June 2, 2006. ^ "Project Methodology: Chapter Three, South Arizona Avenue Entry Corridor Study, City of Chandler" (PDF). chandleraz.gov. Archived from the original (PDF) on August 13, 2017. Retrieved March 27, 2018. ^ "Project Methodology: Chapter One, South Arizona Avenue Entry Corridor Study, City of Chandler" (PDF). chandleraz.gov. Archived from the original (PDF) on August 13, 2017. Retrieved March 27, 2018. ^ Final Report, South Arizona Avenue Entry Corridor Study, RNL Design. ^ "Leading Employers". www.chandleraz.gov. Archived from the original on April 18, 2016. Retrieved April 16, 2016. ^ "Shake a tail feather, get out to Ostrich Festival". azcentral.com. ^ "Chandler site picked for tolerance museum". azcentral.com. ^ "National Register of Historical Places – ARIZONA (AZ), Maricopa County". nationalregisterofhistoricplaces.com. ^ "Playful City USA Communities". kaboom.org. ^ "Cultural Inventory Project: Chandler Public Library". cip.lib.az.us. Archived from the original on October 1, 2006. Retrieved March 27, 2018. ^ Paterik, Stephanie (May 26, 2005). "Price Corridor ripe for development". Arizona Business Gazette. Retrieved April 14, 2010. ^ "Interactive City Directory". Sister-cities.org. Archived from the original on April 16, 2017. Retrieved April 16, 2017. ^ "Historic Structures and Neighborhoods". chandleraz.gov. Archived from the original on March 24, 2014. Retrieved May 12, 2013.